This pages documents the proposed infrastructure for handling package uploads, builds, and archive inclusions. Only source package uploads are accepted, and the process is simple and acyclic. SFTP is used to upload packages for ease of maintainer authorization (uploaded files need not be signed; uploaders are simply authorized by their SSH keypair). A reviewer (whose job is similar to that of Debian's ftpmaster team members) examines the changes file and, if necessary, the source package itself and decides to either accept or reject the upload. If accepted, the package is added to the master build queue and all of the relevant build queues. Each build daemon periodically checks the queues for which it is responsible. If packages are waiting to be built, it attempts to build the oldest one (first in, first out). If the build is successful, the daemon adds the produced binary packages to the archive queue. Either way, the queue run ends with the removal of the processed source package from the relevant queue. When the master build daemon detects that a package no longer exists in any architecture build queue, it moves the source package and changes file into the archive queue. When the archive inclusion daemon finds a source package in the archive queue, it includes in the archive the source package along with all of the built binary packages. Users can finally download the source and binary packages from the archive using opkg. buildq will be a utility used by upload reviewer(s) to either accept or reject package uploads. As this is written, uploads and build daemons must all be on the same filesystem. This can be changed someday by introducing a new queueing daemon and reducing buildq to a simple uploader (removing all queueing logic). This utility handles step 2 in the process above. build for any architectures or platforms. buildd will be a daemon that builds packages in its queue(s). 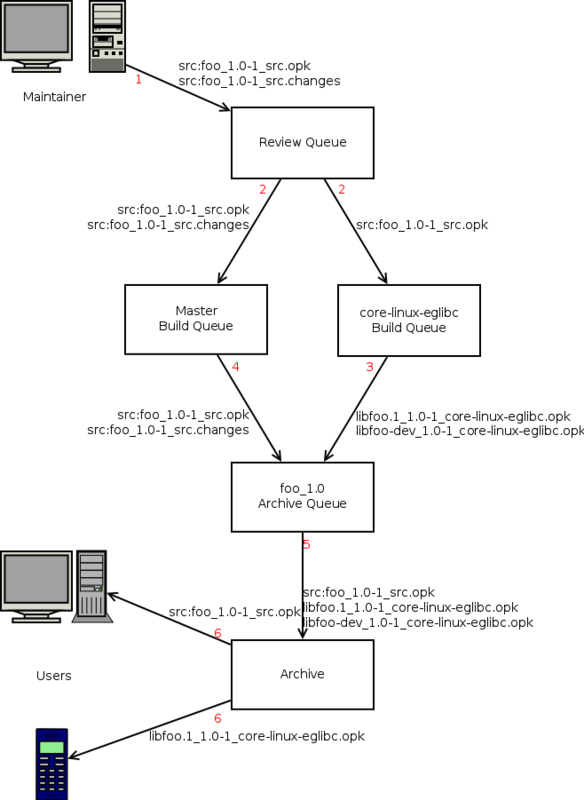 One buildd instance can be responsible for multiple architectures if the queues are linked together. This daemon handles step 3 in the process above. A possible name expansion is "builded it" (as in "Where's my package? Have the build daemons builded it yet?") when spoken quickly. builddd will be a daemon that watches the build daemons and acts on successful and failed builds. This daemon handles step 4 in the process above. archived will be a daemon that includes built binary packages into the package archive. This daemon handles step 5 in the process above.